If this is the first time you use ACU’s email, check here to set it up. ACU uses Google’s Gmail tool. Once you have set up your email, you can access your email through MyACU. 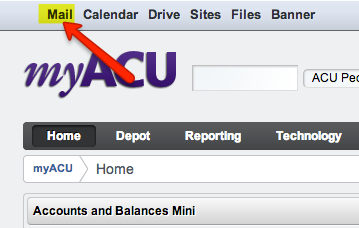 Once you are logged in to myACU, you will see “mail” appearing at the top, clicking on it will launch your Gmail. For further information about using ACU email, for instance, set up email on your computer or smart phone, check this page. If you need help using Gmail, we recommend that you check the Lynda.com tutorial on Gmail.